Noted Home: a decorating notebook: pink! pink! well what's wrong with pink? pink! pink! well what's wrong with pink? This labor of love is done for now! When my six year old said she wanted a pink room I resisted for a little while. But then I decided to embrace it. This is what it looked like half way through. And here it is in all it's girly glory! The dresser was thrifted a few summers ago. It was in pretty bad shape and it could only be recused with distressing. It's still a great and solid piece of furniture. The message boards were recovered here. The lamp is from Home Goods clearance. The owl bank is from Urban Outfitters. And the hula dancer is a gift from Hawaii. The bed is from a thrift store. Both pillows are from Home Goods as well as the clearance bedding for $30.The framed doily is from my Great Grandma and I love it in this room. I always love to have something with a story and a little bit of history. The gallery wall was from things we already had and frames from Michaels using my trusty coupons. I got all 6 frames for less than $15. Tomorrow I will link to all the artwork. It's almost all free. Even the doll bed got a little makeover! Much needed by the way. The doll bed is from Grandma from Target. Here are the furniture fix ups. There will always be something more to do. New lighting someday for example. But for now I am really happy with how it turned out. And so is she. I love that her face lights up every time she sees something new in there. I love all the colors! 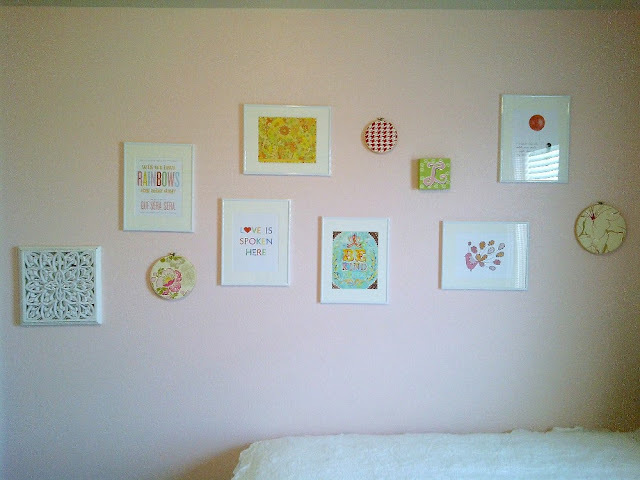 Sade's walls are a similar light ballet pink color (she picked it) but after painting the walls months ago I keep stalling to decorate it because the color has me intimidated. thank-you for the compliment! 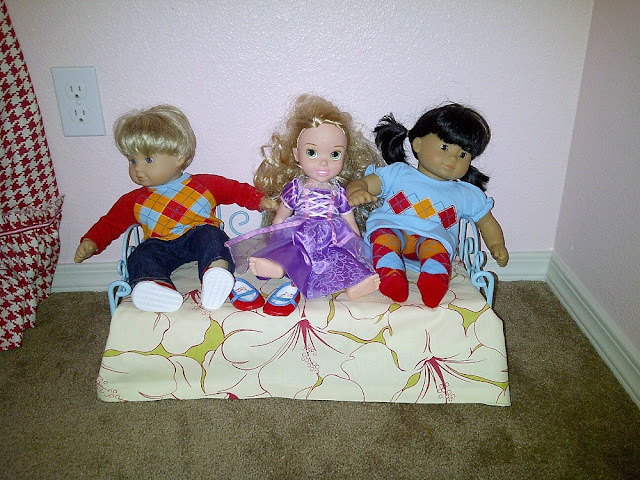 And I love how you gave the doll bed a make-over! 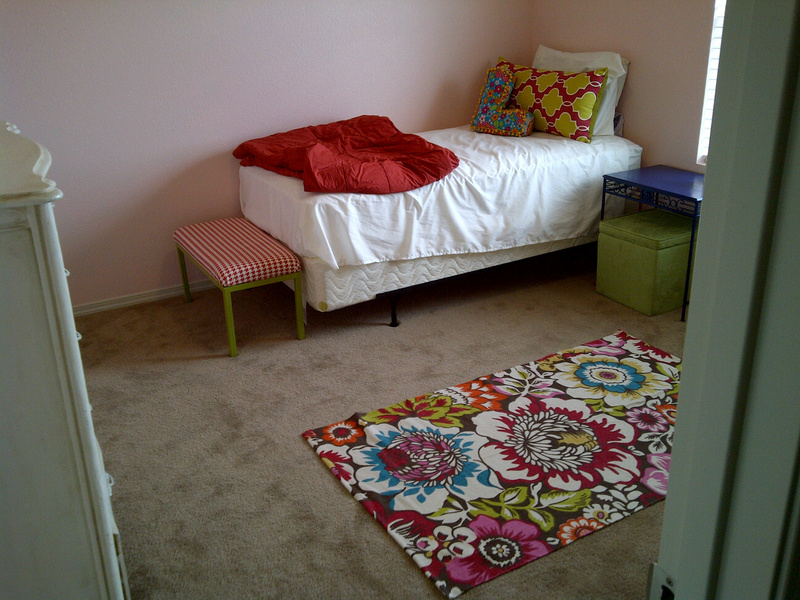 Such a beautiful room...what little girl wouldn't love this?? Thanks so much for sharing at Creative Bloggers' Party and Hop, I am co-hosting this week and it was so great finding you there! Now following, hope to see you soon! What an adorable room! 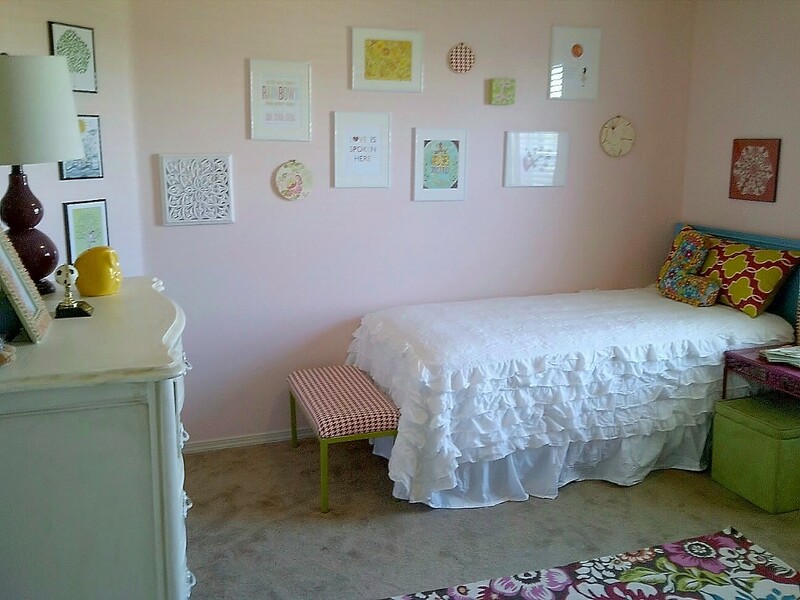 Love the fabric you used for the message boards, it's actually the exact fabric I used for my little girls' crib bedding :D And, the doily above her bed is such a special touch. Amber thanks so much for stopping by my blog...I didnt' know if you wanted to change this at all, but I couldn't reply to your comment...you have yourself listed as a "non-reply" blogger :( If you did want to change it so your new blogging friends can write back to you, you can do that from the "edit profile" tab on your dashboard :) Hope to talk to you again soon! 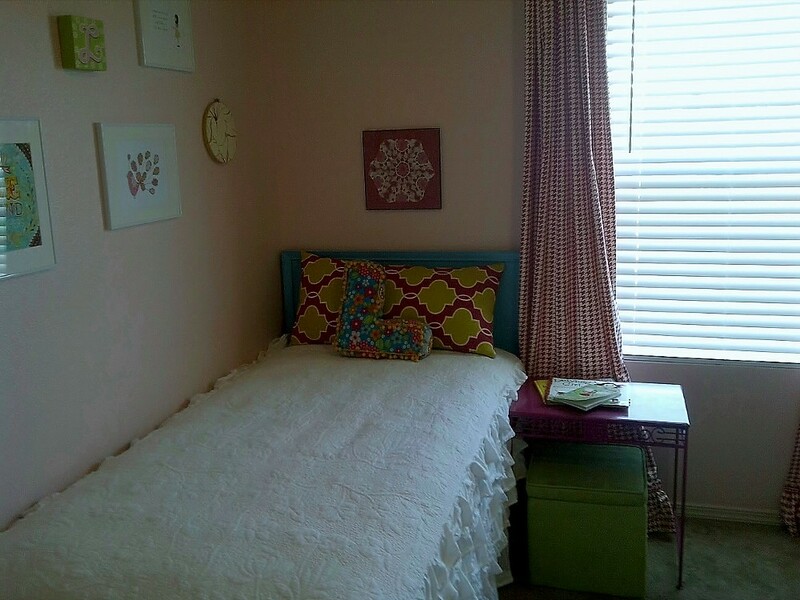 Cute bedroom! 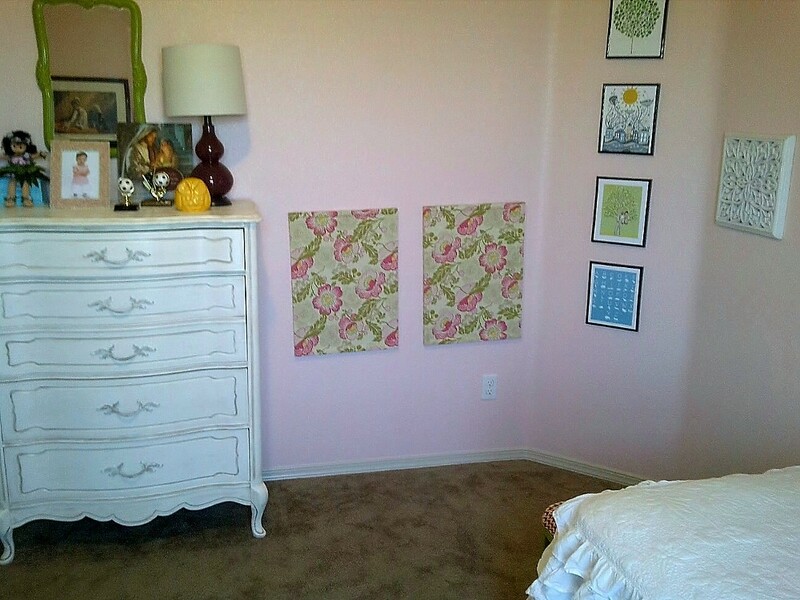 My daughter wants me to re-do her room in pink too. I might have to steal a few ideas from you! the room is beautiful. Good job. Thank you so much for sharing and linking up to show and share #2. There is nothing wrong with pink and lots of it! 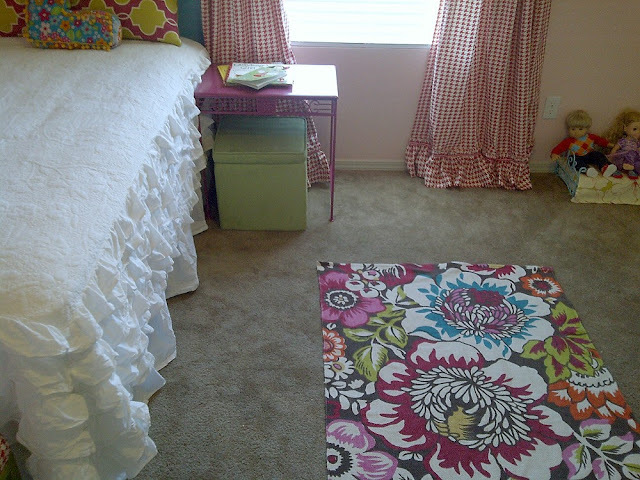 I love all the fabrics and different textures you used! Thanks for linking up with us at Show and Share! What a darling bedroom! I love the colors! I love this bedroom! Thanks so much for linking up to Tuesday Talent Show! I would love to have you stop by and link up again with more great projects!